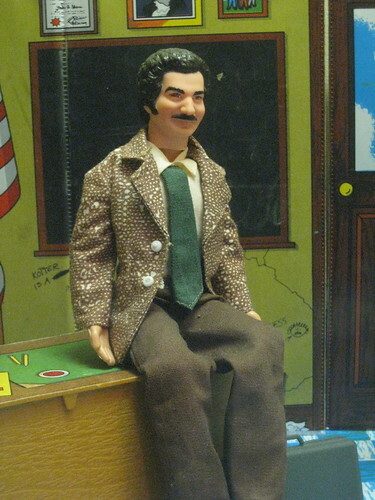 Mr. Kotter Figure from the Children's Museum, Indianapolis. Image via flickr The Kozy Shack. In Brentwood, MO, a high school art club brings artwork to victims of the devastating tornado in Joplin last May. The Art Works club teamed up with art teacher Tim Remple to create art to adorn the bland, modular trailers where many students attend school while local schools rebuild. Also in Missouri, Lee’s Summit art teacher Sarah Poff gets the Q&A treatment in her local newspaper. In the interview Poff discusses how teaching has influenced her style of folk art and her own artistic evolution—including childhood forays into sculpture using cheese wax. (Confession—the Art Advocado had grand illusions of creating sculpture from BabyBel cheese wax as well...but alas, she was born an advocate, not an artist). The Houston Chronicle published an art teacher profile of The Woodlands, TX teacher Laurie Stone Adams. Adams, who was recently awarded The Woodlands Waterway Art Teacher of the Year, told the Chronicle she knew she would be an art teacher by the time she was in eighth grade. Adams also discusses incorporating art history into her classes, which appealed to this big art history nerd. In higher ed news, a joint exhibition at the Utah Museum of Fine Arts and the Salt Lake Art Center celebrates the artistic legacy of artist and art teacher Doug Snow, who passed away in 2009. Snow, whose own work synthesized landscape with abstract expressionism, taught at the University of Utah for 35 years. KCPW has a lovely interview with the curator of the exhibition who details Snow’s artistic style and his devotion to teaching. Did you win an award, make the local paper, or have a remarkable story to share? Let the Art Advocado know about it for a future art teacher roundup! Comment on the blog, tweet me @DavisPub, find Davis Publications on Facebook, or email me at alisondwade@gmail.com. I enjoyed the comments you made about my newspaper article. The volin was auctioned off for $350.00.